Plastic Lid Ladybugs: a cute kid's craft made from recycled milk lids! I’ve been saving the lids from my milk jugs just to make these little Plastic Lid Ladybugs, they make a very simple kid’s craft and fit perfectly in the recycled crafts category! 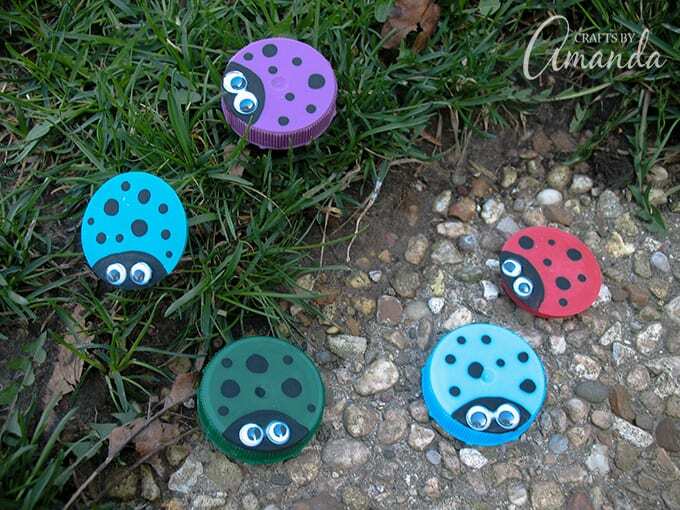 You might recognize my Ladybug Painted Rocks, or the multitude of other ladybug crafts I’ve done in the past. They are just so adorable, and make a perfectly simple craft project for every age! In case you’re wondering about all the different colored lids, they come from whole milk, 1% milk, buttermilk, and juice. Most of you know I’m a baker and post lots and lots of recipes on my cooking blog, so I go through a lot of buttermilk and whole milk. I didn’t take any step by step photos of these as they are so easy, step by steps just aren’t necessary. 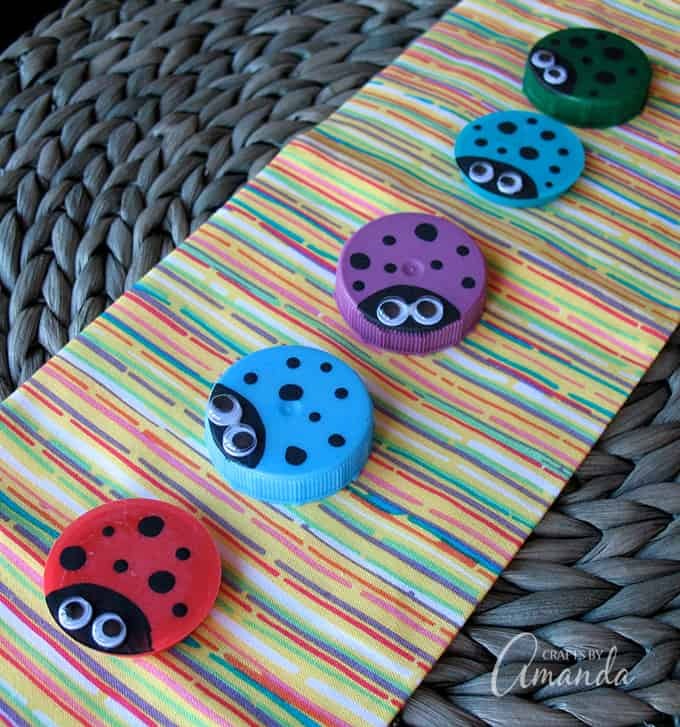 These plastic lid ladybugs are a really easy craft for kids, and you only need a few supplies. Optional: You could make these into magnets, but you would need to fill the lid with something first. I would recommend using something lightweight, like cardboard. Cut it into a circle and glue it inside the cap, then add a magnet. 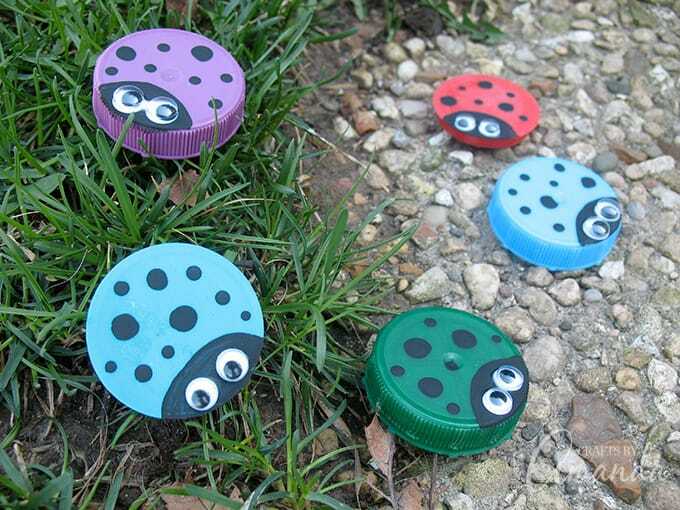 This plastic lid ladybugs craft is a great project to do with kids, or as a group project. A great opportunity for teaching kids to reuse and repurpose things in unique ways, all while having fun and being creative! 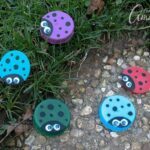 Another great recycled ladybug project is these Egg Carton Ladybugs, or you might also be interested in the super adorable Recycled Jar Lid Owl Craft! This post was originally published on this blog on April 10, 2010. Wash and dry the plastic lid. Paint on the head by using a paintbrush to add an almond shape at one end of the lid. Use the handle end of a paintbrush dipped in black paint to add the spots. Make some spots larger than others. Let all the paint dry. Use white craft glue to add the wiggle eyes. Optional: You could make these into magnets, but you would need to fill the lid with something first. I would recommend using something lightweight, like cardboard. Cut it into circle and glue it inside the cap, then add a magnet. These are so cute! I think my preschool kids would love making these! We might just get to work on them right away!